We are the experts in gear manufacturing, you have been searching for, to get the finest in gear products, service and advice. Fixed 30 helix angle double helical gears up to 1.5m diameter, with a face width of 305mm and 16 module pitch. 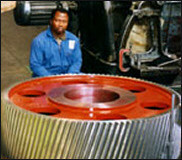 We manufacture and supply a wide range of chain sprockets.